Most football fans first get into football through their parents or grandparents. Your mum or dad will take you to a game and the bonding experience sparks a lifelong passion for the game. You'll probably support their team too. Sometimes, the same process happens with a grandparent. Whichever variant of this process got you into football, we can all agree that creating memories with family members is the best part of being a football fan. 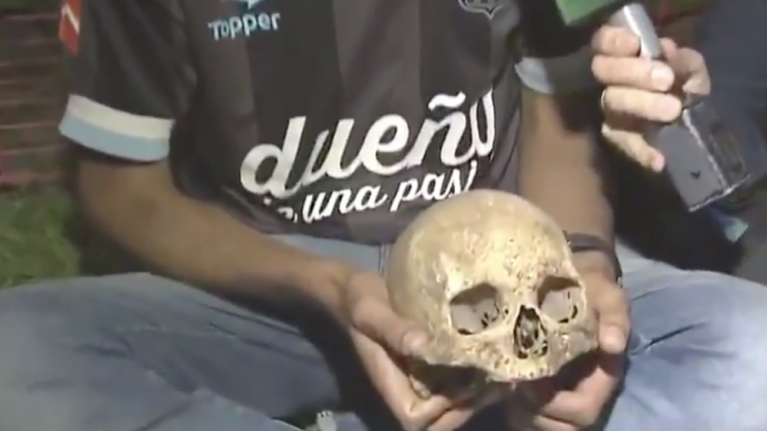 On that note, one Argentinian football fan, Gabriel Aranda, was so desperate to share the experience of Racing club's league title celebrations with his grandfather - who, I should mention, has passed away - that he brought the his skull to the parade. Yep, the remains of a dead man's skull. Bought it with him. To a victory parade. "I brought my grandfather, Valentín," Aranda explained to TNT Sports. "I took him out of the niche whenever Racing played. It's the cabal, he's proud because I took him out," said the fan. It was Racing's first league title since 2014, which they secured on the final day with a 1-1 draw against Tigre. After the violence that occurred before the Copa Libertadores final in Buenos Aires this season, we were expecting to see some craziness at these celebrations, but nothing quite like this. And while it is heartwarming in a way, it's also very very odd, isn't it? I'm sure his grandfather was a cracking chap, but it is weird, right?